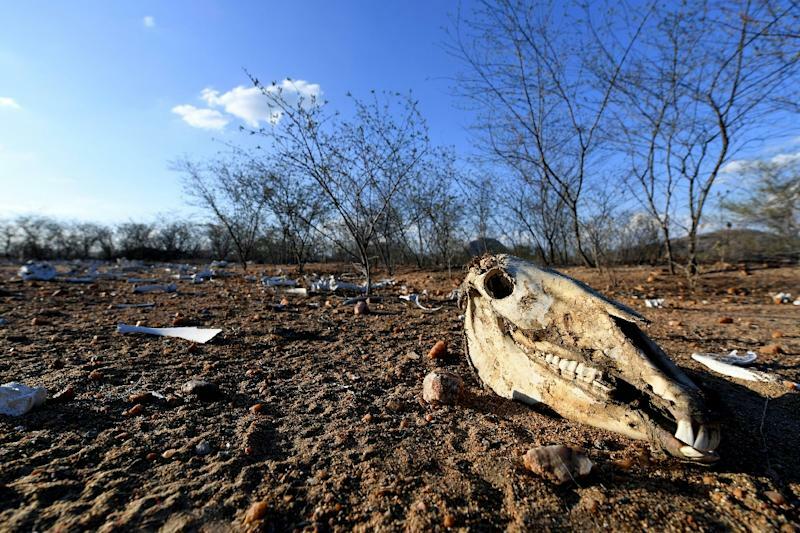 Quixeramobim (Brazil) (AFP) - A cow's skull lies baking in the sun and nearby another dead cow rots, symbols of the desolation gripping northeastern Brazil during its worst drought in a century. Farmer Kerginaldo Pereira, 30, walks through the dust and cactuses in dismay. There are in all about 30 skeletons of cattle, donkeys and other farm animals in a sort of open-air cemetery set aside in his settlement of Nova Canaa, in Ceara state, to avoid spread of disease. "Most are animals that died of thirst or hunger. Sadly, that's the reality. So many animals have died in these five years of drought," Pereira told AFP. The semiarid northeast of Brazil, known as the Sertao, is used to rain shortages but no one can remember a drought like this. There has been almost no rain since 2012 and the leafless, desiccated landscape has the appearance of having been in a vast fire. Rivers and reservoirs that used to serve rural populations are not coping. The authorities estimate that reserves are at six percent capacity, with some completely emptied. Experts say that a cocktail of factors has produced the disaster: a strong El Nino in the Pacific, heating of the north Atlantic and climate change that has seen temperatures in Ceara rise by 1.3 degrees Celsius (2.4 degrees Fahrenheit) in 50 years. Pereira said he had to sell his other three cows and 10 sheep, fetching poor prices because they were "skeletal." Like others in Nova Canaa, home to 70 families near the town of Quixeramobim, he could no longer afford to feed the animals as well his two small daughters. Everyday activities, even washing clothes or drinking, have become a luxury in the Sertao, which extends across eight states. The region has 25 million inhabitants and of them three million have insufficient water, according to state government figures -- a ratio that shoots up for those living in the countryside. Rural communities depend on government water trucks, which fill cisterns. Even so there is only enough for about 20 liters (5.3 gallons) a day per person, far off the World Health Organization's recommended 50 to 100 liters a day, for drinking, cooking and sanitation. To boost this supply, villages get together to pay for hard-to-afford private deliveries, or they go with donkeys to public wells where they stand in line for hours. Some dig their own wells but the water is so salty that even animals refuse to drink. Most families get little more than about $130 a month in social security and emergency drought aide -- barely enough, especially when extra deliveries by truck cost about $50. "We were able to get through one year of drought easily, because the reservoirs still had plenty of water saved, but now we are having to conserve more every day," said Clara Carneiro, a 67-year-old farmer. She saves shower water and reuses washing-up water to give to her dozen cows, which each need 100 liters a day. Tourism has also dried up, literally. The Paradise Bar, with views of the Cedro Reservoir in Quixada, is still open but there are few customers now that the lake, which has a capacity of more than the equivalent of 50,000 Olympic swimming pools, is completely dry. Hundreds of carcasses of turtles and the bones of fish litter the bed of the reservoir. "There was very extensive biodiversity, with a lot of fish, amphibians, mollusks and many birds who fed on the fish," said Wagnar Docarm, taking part in a Quixada State University study on the dead animals. "Now it's all gone." Hugo Fernandes, a zoologist leading the study, said the turtles would usually be migrating "but they couldn't find a way to get across the reservoir." Local people who depended on fishing in the reservoir say the drought has devastated them. "Everybody here lived by fishing. There were a lot of fish, shrimps," said Francisco Elso Pinheiro, 75. He said that by selling fish he had been able to double his approximately $300 a month pension. His boat now? It's anchored in the middle of dry land. In the worst recession for a century, the government often delays aid payments, while a much-awaited but controversial project to divert the major San Francisco River was held up after the main contractor was caught up in a nationwide corruption scandal. 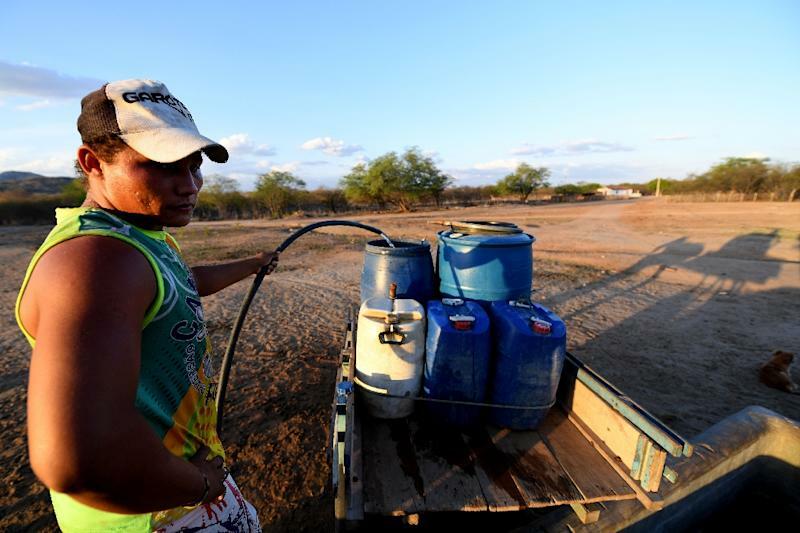 "There's no doubt that the political crisis, together with the economic crisis, have made the water situation worse," said Ceara state's top water official, Francisco Teixeira. Weather forecasts for 2017 give little hope of the Sertao getting a break, let alone refilling the reservoirs. The small communities around Quixeramobim say only God can help them. "We have to pray because the only one who can help is above. 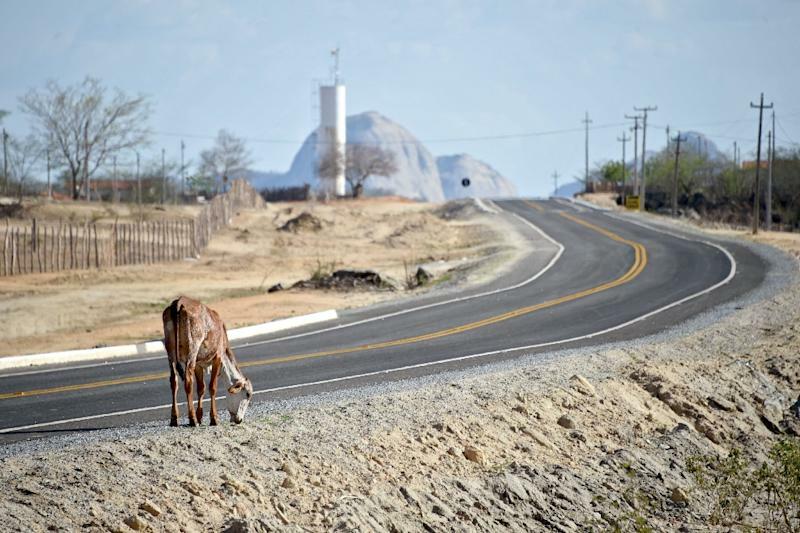 The politicians forget about us once elections are over," said farmer Sebastiao Batista, 66, looking upward.